Glassy eyes. Fixed smiles. Childlike glee frozen in time. To put it bluntly, dolls are burn them to the ground and salt the earth levels of terrifying and horror filmmakers know fine well. Some directors are worse than others - James Wan, I’m looking at you - but there are few things as primally unsettling as a toy gone rogue or just plain used for evil. From dolls that move when you’re not looking, to full on possessed murder clowns, here’s our rundown of the downright creepiest dolls in horror movies. No, nothing moved out of the corner of your eye, nothing at all. Sweet dreams. Ventriloquist dolls are terrifying, there’s no denying it. Those unhinged jaws, unblinking eyes, painted on hair… Even if you didn’t read the Goosebumps book Night of the Living Dummy, there’s something unnerving about those lifeless blocks of wood that means you just can’t stop thinking about them armed with a kitchen knife. Thanks for thirty years of nightmare fuel, RL Stine. Dead Silence - the first of three James Wan movies on this list - preys on every fear you’ve ever had of the horrid inventions. Billy arrives motionless in a box on the doorstep of Ryan Kwanten’s Jamie Ashen and it’s no coincidence when Jamie comes home the next day to find his wife dead in their apartment with her tongue cut out. Billy isn’t the only doll in Dead Silence either. Jamie travels to the town of Raven’s Fair to solve the mystery and things get significantly creepier from there on in. It's brilliant nightmare fuel. In the same pulsing horror vein as Freddy Krueger, Chucky is somehow one of the ex-villains who now bizarrely fall into comedy. While this might be the case in 2016, the original 1988 Child’s Play still holds some serious frights. Much like Krueger, Charles Lee Ray is a nasty piece of work, a serial killer obsessed with voodoo who spirits himself into a Good Guy doll to escape the police. When single mom Karen Barclay picks up the doll cheap for her son, she unwittingly takes a living toy into her home who really doesn’t just want to play at tea parties. What’s worse than waking up in a death trap where you’re going to have to sacrifice an eyeball or perhaps a limb to survive? Waking up in a deathtrap with a hideous doll on a tricycle giving you instructions about how to save your sorry life, of course. He’s never officially been named in any of the movies but this work of Satan was coined Billy by Saw director and co-creator James Wan. Entirely inappropriate as a Halloween costume for children since 2004, Billy was revealed in later movies to be the physical representation of Jigsaw killer John Kramer’s lost baby. The swirly cheeked monstrosity first appeared on a hissing CRT screen in the original Saw telling Amanda Young how to survive the reverse bear trap wired into her skull. He features in all seven movies and was upgraded throughout production with animatronic facial features for remote control frights. Aren’t you glad you weren’t on that set? Long before Tim Curry’s Pennywise sneaked onto screens, one particular clown had already had a terrifying effect on an entire generation of kids too young to see Poltergeist but who watched anyway. Who knows why anyone thought it was ok to have that creepy red headed horror fiend in the same room as a child anyway but the scene where young Robbie starts by throwing a blanket over it is sheer terror. Shh, you think, it’s fine, he’s just going to cover it up but by the time he wakes up and it’s gone, it’s genuinely hands over face levels of terrifying. Add in its hideous grin when the clown finally grabs Robbie to strangle him and you’ll wonder how this film was ever rated a PG. Dolls = bad. Clown dolls = just no. 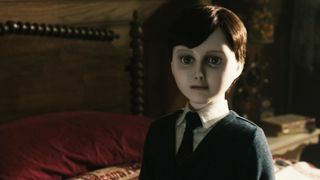 The doll so scary that she has her own cabinet in real life paranormal investigators Ed and Lorraine Warren’s museum of possessed things, Annabelle is terrifyingly bad news. She originally featured in James Wan’s The Conjuring but got her own spin off prequel in 2014 to show exactly what happened before she ended up in a box that says ‘Don’t touch.’ Personally, I’d put her in a box that says ‘Please incinerate’ but that’s just me. Despite a slew of suicides, tales of demonic possession and some seriously creepy goings on in an apartment building as she plagues the lives of a family, Annabelle still doesn’t end up in the cabinet. Next year’s Annabelle 2, from Lights Out director David F. Sandberg, will hopefully take us up to her imprisonment. As creepy as the doll is, her movie debut wasn’t the scariest so let’s hope Sandberg can fix things and bring in the terror she deserves. So you escape a hellmouth of a relationship and need a new life, what’s a better plan than getting a job as a nanny and crossing the Atlantic to look after an only child? So far, so good, right? Well, wrong. When The Walking Dead’s Lauren Cohan’s Greta moves from the USA to England, she chooses to join a family with a son called Brahms. Not only does no sane person on this side of the nineteenth century call their child that, it turns out that Brahms isn’t actually a real boy. He’s a porcelain doll in a suit and tie and comes with a specific set of rules while his ‘parents’ are on holiday. In slightly grim news, the original Brahms died in a fire when he was just 8 but at least Greta doesn’t have to cook for him. Of course things don’t go to plan and the liquid-eyed doll ends up appearing and disappearing around the house while no one else is around. The film is a bit of a dud but Brahms himself is a world of nope. The less I say about this wonderful short, the better but Pixar, this aint. Enjoy.